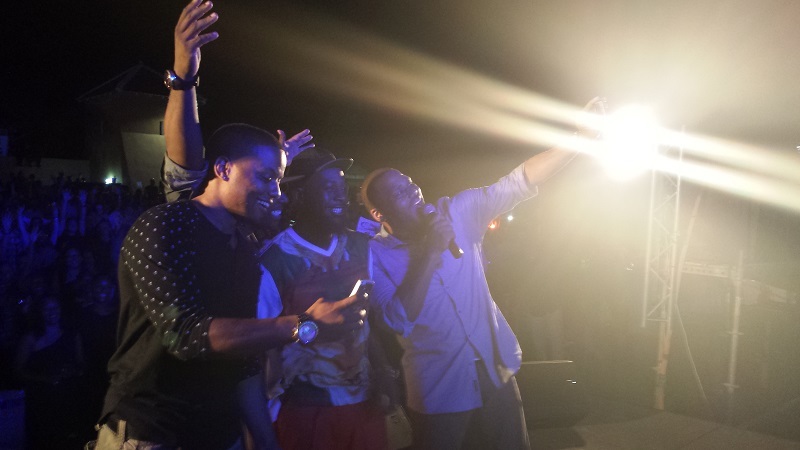 The comedians closing the comedy show with a memorable selfie with the audience. Anthony Anderson hosted the show and kept the audience laughing. Comedian Ron. G. took his act to the stage and continued the momentum of laughter. Zainab Johnson shone on stage with her strong presence and funny stories for the patrons. Rip Michaels had the audience in hysterics from the moment he stepped on stage until the second he stepped off. Karlous Miller and Uzman both keep track of time before their performances. An audience of 1200 people gathered at Landhuis Brievengat to enjoy comedy under the stars in Curaçao. People started to flood the after-party venue immediately after the comedy show. The 'at-capacity' after-party crowd, including the night's comedians, enjoyed DJ Power's remixes and grooves until late. It was a memorable occasion for tourists and local residents, an evening filled with laughter, entertainment, and most of Curaçao. Courtesy of XCapefest, the April Fools Comedy Show took place on Easter Weekend at the outdoor venue Landhuis Brievengat on the tropical island of Curaçao featuring a line-up of international comedians and a festive after-party with international and local celebrity DJs. Curaçao, typically known for its musical festivals and events, attracted locals and tourists alike to the island’s first international celebrity all-star comedy show. The celebrity line-up included comedians Anthony Anderson from the hit sitcom “Black-ish”, Rip Michaels from “Wild N’Out”, Zainab Johnson from “Laugh Factory”, as well as Ron G., and Karlous Miller known from NBC’s “Last Comic Standing.” All uncertainty of potential language barriers disappeared when each comedian took to the stage and had the audience laughing hysterically. Evident highlights of the comedy acts were Anthony’s dancing skills and flexibility, Ron’s “Swagger walk” scenarios, Rip’s experiences in life that everyone has once encountered themselves, Zainab’s “flirtatious shoulder,” and Karlous’ “peanut sauce” issues. Participation by locals from the audience was encouraged by the comedians for memorable moments on the stage such as the "Dancing Contest’"and "Selfies with the Audience." Once the show ended, the audience was directed to the back and upstairs of Landhuis Brievengat for the after-party. The party started off with Curaçao’s local DJ Maarten Schakel from Dolfijn FM spinning popular dance music. Shortly after, international Award-winning DJ Power, also known as a celebrity "Remix King," took over the turntables and had the crowd as well as the celebrities showcasing their best moves on the dance floor with the latest rhythms. Later on in the after-party, Dancehall artist Uzman gave everyone a special performance entertaining the audience including the show’s comedians as they looked on. The patrons enjoyed the drink specials and beats under the stars until shortly before the break of dawn. The island of Curaçao anticipated an event of this caliber for a long time and seemed pleased with the results. The audience of 1200 patrons included majority of very well-known and important Curaçao figures as well as sponsors seated in the front rows. The amusement of the whole XCapefest April Fools Comedy Show audience and enjoyment of the after-party was expressed heavily through social media. The visiting celebrities also took to social media to express their pleasurable experiences on the beautiful island, ranging from their accommodations at the Acoya Hotel, Suites, and Villas Resort to swimming with the dolphins at the Curaçao Dolphin Academy. The welcome received by tourists upon arrival in Curaçao for the XCapefest show was warm, friendly, professional, and noted as “unlike no other” on any other island in the Caribbean. Overall, the launch of the XCapefest event series on the island of Curaçao created by 88 Rockorsou and Starline Promotions proved to be a successful and lucrative one for their tourism industry. Positive feedback about the April event has been circulated among the residents of the country who evidently enjoyed the opportunity to meet and greet the entertainers of the comedy event as well as the event itself. Although there are a few upcoming regularly scheduled music festivals attended by many throughout the year, Curaçao is definitely looking forward to enjoying the next XCapefest event.